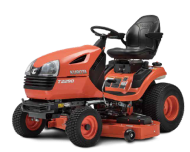 Powerful, efficient and comfortable, Kubota’s T Series ride-on mower range has been created with the residential customer in mind. We know your time is valuable, that’s why we created the T Series range to help you get more out of your day, achieving perfectly manicured lawns without the fuss. With easy maintenance and long service life, you will come to rely on the Kubota T Series for years of dependable use.